Organised athletics began in Essendon in 1897. Immediately Essendon Harriers developed into one of the strong clubs, winning a Victorian championship event most years. Two of the greatest Australian champions of the first decade of last century were Essendon athletes. ‘Dad’ Wheatley was the country’s topmiler and half miler, becoming our first Olympian. Another Essendon athlete, Alex Stilwell was the champion cross country runner winning many 5 and 10 mile titles. In 1910 the major newspaper of the day wrote “as expected, Essendon asserted its authority and is probably the best cross country club in the country.” Also in 1910 the only two Vi ctorians selected for the forerunner of the Commonwealth Games in London were from Essendon. known for the annual half time race at a home Essendon football match. Aberfeldie track opened in 1972. 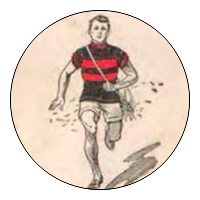 Six years later Essendon merged with East Melbourne Harriers, a club established in 1895, bringing an outstanding coach, sprinting strength and a rebirth of enthusiasm. Immediately Essendon-EMH was winning A-grade premierships and was again among the strongest men’s clubs in Victoria. A later merger, with the predominantly women’s Essendon-Aberfeldie in 1993, contributed to making Essendon the strongest and largest athletic club in Victoria as measured by championship results and membership. When three Essendon athletes competed at the 2016 Rio Olympics, the club had been represented every two years in Olympics or Commonwealth Games for 28 consecutive major Games. An interesting development this century has been the growth of coaching strength at Essendon. There is a squad of more than a dozen coaches at Essendon, many of whom have been selected to coach on National teams. This extraordinary coaching team ensures that Essendon should continue to develop outstanding athletes for the foreseeable future.